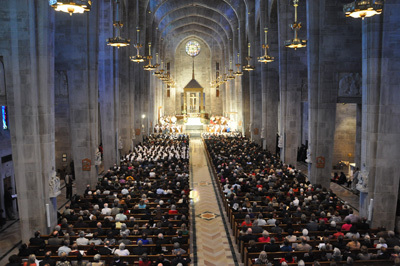 BALTIMORE (CNS) — In a day “full of joy” for the Archdiocese of Baltimore, Catholics from Maryland and beyond packed the Cathedral of Mary Our Queen in Baltimore Nov. 2 for a Mass to celebrate the 225th anniversary of its founding as the first diocese in the United States. Before the Mass, Archbishop William E. Lori, 16th archbishop of Baltimore, said he was grateful for those who had gone before. The two-hour celebration began with a procession of banners from all the schools in the archdiocese and a large Knights of Columbus honor guard. About 200 seminarians joined the procession, followed by deacons, priests, an archbishop and nine bishops, plus Cardinal Edwin F. O’Brien, a former archbishop of Baltimore. In greetings at the beginning of Mass, Cardinal O’Brien, who is now the grand master of the Equestrian Order of the Holy Sepulchre, based in Rome, recalled joining Pope Francis for a Mass last spring in the Upper Room in Jerusalem, where Jesus established the Mass and the Eucharist. He noted that Pope Francis wondered how much love and goodness had flowed from that Upper Room into the centuries. He added that the original Diocese of Baltimore, established Nov. 6, 1789, with about 25,000 Catholics, now encompasses 195 dioceses with 65 million Catholics. In his homily, Archbishop Lori noted that Archbishop John Carroll, America’s first bishop, accepted a huge challenge to shepherd a region that stretched from Canada to Florida and Louisiana, and from the Atlantic Ocean to the Mississippi. Archbishop Lori praised the clergy and men and women religious who had contributed to the growth of the church and its mission to educate and minister to those who are ill or poor. “Yet the story of the Archdiocese of Baltimore isn’t written only by priests and religious,” Archbishop Lori said. “Mostly, it is written by you, the lay women and men of this archdiocese. It is being written in the homes you have established where the faith is handed on from generation to generation. He said the archdiocese needs to continue to assist families as the center of evangelization, to reach out to diverse cultures and to promote the dignity of all human life. “What should we do to make our parish communities vibrant, our schools solid and our charities signs of Christ’s compassionate love for the vulnerable?” the archbishop asked. 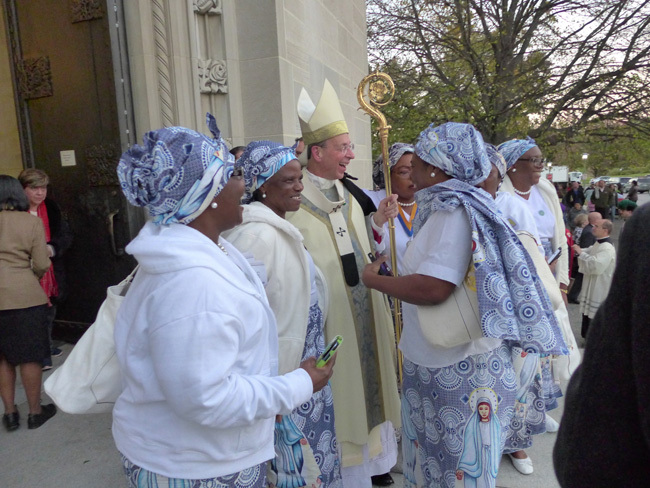 Ruth Vinga, a parishioner of St. Gabriel in Woodlawn who is originally from Cameroon, joined a group of women dressed in bright skirts featuring the image of Mary as they gathered around the archbishop at the end of Mass. They sang and danced as the archbishop laughed with them. Vinga said she was excited to participate in the Mass because the archdiocese has accepted immigrants from Cameroon and their culture. Rob Judge, executive director of the National Shrine of Elizabeth Ann Seton in Emmitsburg, came to the Mass with his wife, Kathleen, and their seven children. St. Elizabeth Ann Seton, who founded the Sisters of Charity, established what is recognized as the first Catholic school in the United States and is the first American-born saint. Judge said he was glad to celebrate the 225th anniversary with other Catholics. “This is a real celebration of the faith and God’s mercy — to continue to be a vehicle for God’s grace,” the parishioner of St. Mary Parish in Hagerstown said after the Mass. Gunty is associate publisher/editor of the Catholic Review, newspaper of the Archdiocese of Baltimore.